"Women Workers on Tour," Oregonian, October 20, 1912, 13. Seven ardent supporters of suffrage have for the past week been engaged in a series of excursions into the territory lying about Portland, in the dissemination of suffrage literature. In an automobile a flying trip is made through some territory selected, and in the wake of the “flying squadron” the signboards, crossroads stores and private mail boxes along the rural routes blossom with a burden of suffrage literature. Last Saturday a circle of 70 miles out of Portland through Milwaukie and Estacada was made. Signs were tacked in convenient places and a veritable storm of literature was precipitated upon the people in the district through which the party passed. 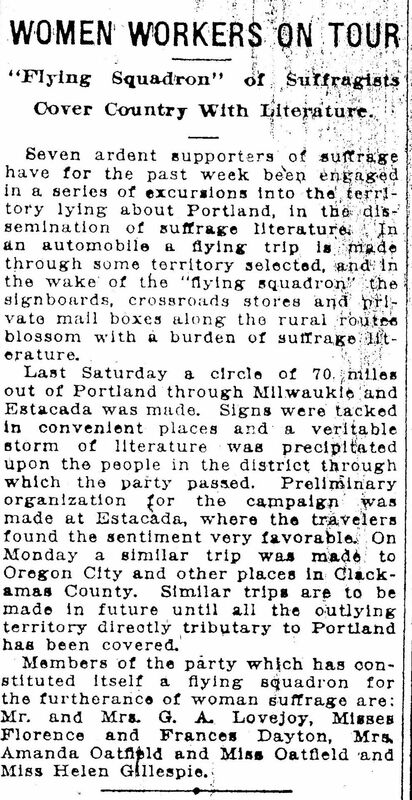 Preliminary organization for the campaign was made at Estacada, where the travelers found the sentiment very favorable. On Monday a similar trip was made to Oregon City and other places in Clackamas County. Similar trips are to be made in future until all the outlying territory directly tributary to Portland has been covered. Members of the party which has constituted itself a flying squadron for the furtherance of woman suffrage are: Mr. and Mrs. G. A. Lovejoy, Misses Florence and Frances Dayton, Mrs. Amanda Oatfield and Miss Oatfield and Miss Helen Gillespie.